The revised hardcover edition of this 745-page book, published in 2014 by the American Institute of Certified Public Accountants, explores the disciplines of intangible asset valuation, economic damages, and transfer price analysis. 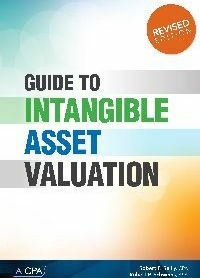 Guide to Intangible Asset Valuation examines the economic attributes and the economic influences that create, monetize, and transfer the value of intangible assets. The revised edition includes an extensive index. Illustrative examples are provided throughout the book, and detailed examples are presented for each generally accepted (cost, market, and income) valuation approach.